By far the very best trainer in B.C. for you to take your warmblood to would be Birgit Stutz in McBride. Birgit is very familiar with big pushy warmbloods and knows very well how to develop them without pushing them beyond their ability. Honestly, I can not recommend Birgit highly enough. It would be well worth the effort to get him to her if you can. He’d be in the best of hands with Birgit! I had the opportunity to do part of my counselling practicum at Falling Start Ranch Academy of Foundational Horsemanship with Birgit and it was life changing for me. My focus is in animal-assisted therapies and the more research I did the more I knew I had to meet Birgit and learn from her. The connection she has with animals is inspiring to watch. She taught me how powerful the impact of my own body language can be with horses and deepened my understanding of what the horse needs from me in order to thrive. About a month has passed since I left Falling Star Ranch. I stayed there for 10 intensive weeks of education in groundwork and riding. My name is Sibylle, and I am from Switzerland , age 45. As I needed a break in my life after more than a year of physical and mental struggle I intended to go back to my (horse) roots. Canada was my favourite destination and “Natural Horsemanship” the ambition to learn. Through the internet I found Birgit and Falling Star Ranch. After a half an hour talk on the phone I knew that Birgit knows her business and I agreed to a mentorship at Falling Star Ranch. To be honest, the first two weeks were quite hard. For the first ten riding lessons I was only riding at a walk. Bitless bridle, lots of struggling with seat, legs, feet, shoulders, elbows, hands. I didn’t expect it would be easy but like this? Well, my last riding lesson was approximately 15 years ago and anyway as a former jockey I loved speed. I didn’t pay too much attention to my “long stirrups seat”. So my troubles weren’t too surprising. Nevertheless I noticed from the first minute that with Birgit I met a great horse person who knows what she is talking about. She sees every detail. She explains the same thing ten or more times very patiently. She is completely with you while she is coaching and she answers every question outside the lessons as well. She has huge a knowledge. She is firm but fair (with human and horses). She loves her horses and treats them excellently. She is patient and polite. She is very attentive and aware. If I was able to do what she said it worked out. And last but not least: She really teased the very best out of me! 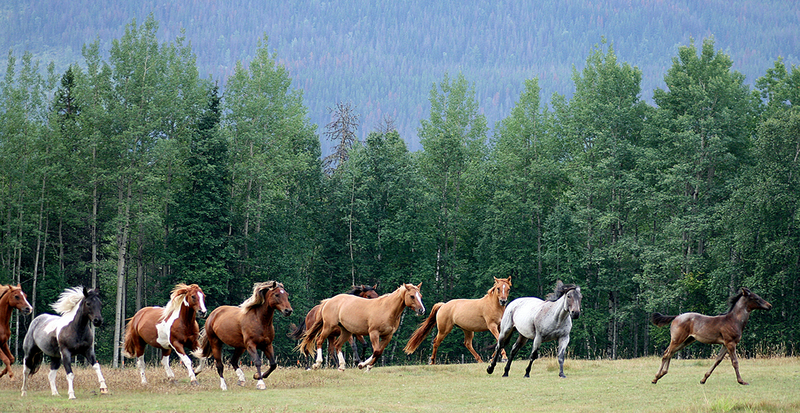 There are so many different horses at Falling Star Ranch. They all have their own personalities and each horse taught me something else which is great. Birgit rides them all regularly so she knows exactly what’s going on. Her horses are all well trained and responsive, not dull, and through their natural keeping they are very alert and sensitive. Through careful training, the horses are allowed to keep their own personalities and stay sensitive and responsive, instead of being shut-down and dull and just putting up with whatever the rider asks them to do. Awesome teachers, as is their human leader. During my stay I made continuing progress. The lessons on the lunge line helped me a lot as well. Towards the end I rode many different horses at all gaits and I started to do some lateral work as well. I look forward to continuing with dressage lessons at my place. I never thought I would like dressage this much, but Birgit, you inspired me with your enthusiasm, your coaching and your knowledge. Since my return to Switzerland, my two pasture horses are my guinea pigs. I try to speak “horse” to them. Play horse games by horse rules. In only a few days our relationship changed a lot. They respect and trust me much more than they did before my stay at Falling Star Ranch. It is as if they would say “Finally she speaks our language. What a relief”. I also started to ride them and wow, they do great because they seem to understand much better what I ask them to do. After my rewarding stay in Canada I started to look at horses differently. I understand what’s in their mind (frame of body is frame of mind). I am so thankful to Chris Irwin who decodes the body language of the horses and who has a very agreeable and understandable way to explain it. And I am very thankful to Birgit who taught me this amazing method so carefully and precisely. What started with a thought, became a desire, turned into a big dream and certification with exceptional recognition! I’m Cindy Handschoewerker from Belgium and I’m a Natural Horsemanship trainer with heart and soul. I don’t have enough words to say how wonderful my journey was and still is by following a mentorship with Birgit. Behind her beautiful smile is Birgit, such a hard-working woman, committed to her horses, and with a big heart for her animals (not only her horses). One day in my research on Chris Irwin, I found the website of Falling Star Ranch in Dunster. I sent an email to Birgit and I soon got an answer back. I saw the mentorship as a beautiful chance and opportunity for myself to extend my own knowledge about horsemanship. I thought that I would feel like the little Belgian in big Canada, but Birgit treated me with so much respect, asked my opinions… and soon it became more like we were colleagues of each other, which gave me a very good feeling. The program was full of variation and flexibility, but intense at the same time. Birgit really wants you to make progress and she teaches with heart and soul. Birgit will stay in my heart forever and our friendship will never die, we will see each other again and keep in contact! After my trip back home I got an email from Chris Irwin congratulating me on achieving my Level 2 Master Certification from Irwin Insights. Chris knew me from a clinic in the Netherlands and published even on Facebook that I’m the first student ever who has come so fast so far in his program! Thanks to Birgit. **After her mentorship at Falling Star Ranch Academy of Foundational Horsemanship, Phoebe Oudshoorn received her silver level certification from Chris Irwin. **Lisanne – or Lissy as we call her – did three mentorships as well as a working student stint at Falling Star Ranch Academy of Foundational Horsemanship (which she calls the “Happy Ranch”). Lissy now runs a guest ranch called Willow Ranch in Valemount, B.C., together with her family and is also an Irwin Insights certified trainer). I decided to do a mentorship program at Falling Star Ranch because I really wanted to find a new way to work with horses. I was not happy with the way I used to work with and train horses. I knew that the horse has a lot of effect on me in general but after a while just training horses I found out that I was just mad at myself all the time because I didn’t have the skills to deal with young horses and I was mad at the horse and had no patience anymore. I hated the way I was but I didn’t know how to changes things and do things better. I was thinking of quitting training horses, thinking it’s not for me anymore. I like working with one horse and building a good relationship with that individual horse. Then I can have a lot of patience. I came across Falling Star Ranch on the Internet, when I was looking for a ranch where they do some kind of horsemanship. I didn’t know of Chris Irwin at all, but I had read some articles on the Internet about him and I really liked the way he sees the horse and helps the horses. With the mentorships program I had two lessons a day and the rest of the day I watched the other lessons and training sessions. I took a lot of notes and it really helped me to understand everything. At the beginning I was even afraid to go close to the herd because everything was so different. I had to be so aware of everything and I was really not used to that! My first riding lesson was a revelation. I felt like a total beginner. The week before I arrived at Falling Star Ranch, I was jumping 4 feet with different horses and here I had a hard time to work the horse at a walk! I was so sore just riding for 45 minutes at the walk. I had to put my ego aside and accept that “I don’t know everything”. But it’s a great thing too. I’m just amazed at the method and how using horse psychology changes the horses. Chris Irwin’s method is based on body language, the language of the horse, as well as our body language. I feel like I was blind for so many years and it’s like I finally opened my eyes and realized how a horse lives. The horses are prey animals and as humans we act as predators, and this can scare the horse, and if we don’t pay attention to what the horse tells us with its body, then we just don’t get the respect and trust. In mid-August, I attended a train-the-trainer certification clinic with Chris Irwin at Riversong Ranch in Whitecourt and received my certification in the Chris Irwin methodology. I look forward to keeping improving my skills and being able to help people with their horses and horses with their riders. I’m going back to Switzerland at the end of the fall and I hope I will be able to help as much as I’m able to and show and spread this method around! I know that people, especially Europeans, are looking for a better way to work with their horses but they don’t really know how! So I am excited to see how it will change! 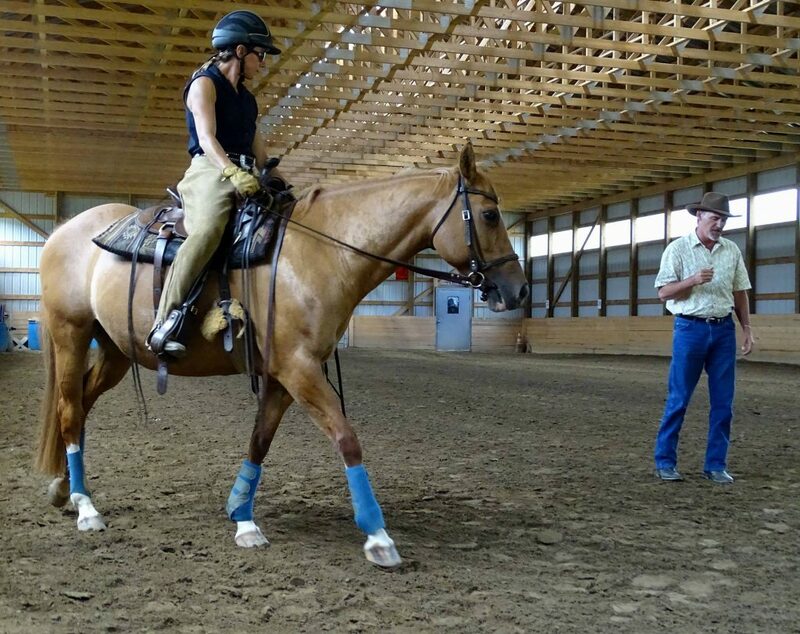 For three months my 4-year-old Arab gelding was at Falling Star Ranch to be started under saddle. Birgit is amazing! I arrived and before leaving she had gone over my goals for the horse and more importantly what kind of ground work I had been doing. Over the next three months she slowly and carefully brought my young guy along. I was kept informed of all his progress with twice weekly reports along with videos and photos. I felt like I was part of the training program and was able to reply and add information with things that I had observed at home. I was very impressed that Birgit never hurried the training and made sure he had mastered each step before moving on to the next one. He is now home and I have been riding a lovely relaxed horse. He is still young and needs many hours under saddle but he is willing, happy and relaxed. Birgit took on my 5-year-old registered Morgan mare “Gypsy” this past summer/fall. I have always started my own youngsters, but this one was so reactive and sensitive that I came off a couple of times, and my nervousness fed hers, so a lovely little mare was soon going to be ruined. And as she is very small, there was not much chance of finding Gypsy a good home. So we decided to invest in a professional trainer for the first time, as well as both myself and my 9-year-old son taking summer-long riding lessons. We were SO fortunate that Birgit’s Falling Star Ranch is just down the highway from us! Gypsy did show her reactivity for Birgit, but 8 weeks later I was able to get on her and under Birgit’s expert guidance, experience the most amazing ride of my life. Like driving a Porsche after a lifetime of old clunkers, with a glaring exception in a wonderful responsive Morgan gelding who adoringly put up with my amateur ways for 27 years. “Sonnet” was a hard act to follow, but back home, Gypsy literally makes me grin every time I get on her back and I look forward to years of thrills on the trail. Birgit is a rare mixture of tough and intuitive, loving and demanding – for horses and people alike. She has demonstrated her true love of horses through orchestrating several local horse rescues, her involvement in the Back Country Horseman’s Association to build and maintain trails, and just being there for neighbours with horse emergencies. A phone call to Birgit with a horse question usually results in her magical appearance in your pasture to lend a hand. Birgit is the real McCoy in the world of natural horsemanship! 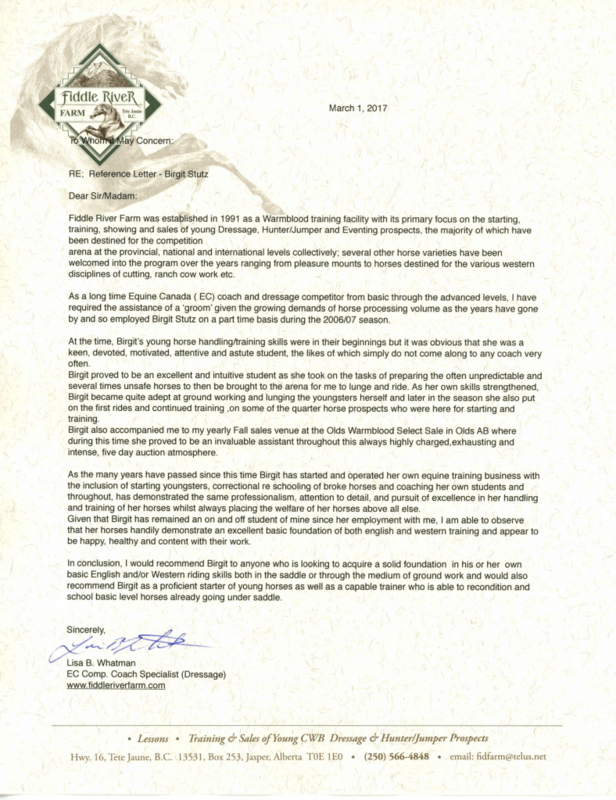 and cannot be used without permission from Falling Star Ranch Academy of Foundational Horsemanship.